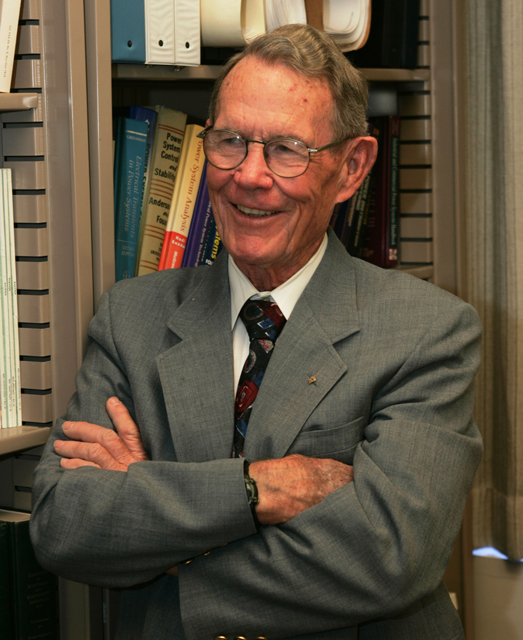 Professor Richard Farmer, who taught electrical engineering at Arizona State University for most of the past 45 years and was elected to the National Academy of Engineering, died at his home in Phoenix on March 26. “Professor Farmer was a tireless contributor to our electrical engineering programs and the electric power industry for more than four decades. During his service at ASU, he made a positive impact on thousands of our students,” said Stephen Phillips, a professor and director of the School of Electrical, Computer and Energy Engineering, one of ASU’s Ira A. Fulton Schools of Engineering. A U.S. Navy veteran, Farmer earned his master’s degree in engineering from ASU in 1964. The next year he began work at Arizona Public Service Co. (APS), the state’s largest electricity utility company, where he would eventually become principal engineer. In 1966 he began teaching one course each semester at the university. After retirement from APS in 1994, having spent almost 30 years with the company, he began teaching additional courses and later attained full professorship. In his time at APS, Farmer led projects that developed technologies to improve the efficiency and reliability of electrical power generation and transmission systems. Innovative techniques for tuning power system stabilizers that he developed became standards in the industry, said Vijay Vittal and Gerald Heydt, both ASU electrical engineering professors. He was elected to the National Academy in 2006. The honor is among the highest distinctions in engineering, as it recognizes outstanding contributions to engineering research and education, advancement of engineering fields and pioneering of new technology. In 1986 Farmer was elected to the status of Fellow of the Institute of Electrical and Electronics Engineers (IEEE), the world’s largest professional association for the advancement of technology. Subsynchronous resonance was a problem for electric utilities in the early days of series compensated transmission lines. Farmer “was one of the core group of investigators who recognized, explained and provided solutions,” said his APS colleague Douglas Selin. Farmer wrote and co-wrote several books and other publications on power systems engineering, and was a sought-after conference speaker. In 2010, the IEEE Power Engineering Society awarded him its Outstanding Power Engineering Educator Award for “outstanding contributions and leadership” in power system engineering education. He also was a valued mentor to both students and younger colleagues. “It was not unusual for students to be in his office at all hours to seek practical advice on a homework assignment, a thesis, or just for advice on a job offer,” Heydt said.